San Ignacio’s market day is the biggest in Belize. It’s held every Saturday morning and lasts until mid-afternoon. San Igancio is often times a stopover for travel groups who want to do see the Mayan artifacts inside Actun Tunichil Muknal. But give the city a chance, and you’ll find there’s enough to do to keep you occupied for several days. This is the tallest temple at Cahal Pech. It’s more than 82 feet high. 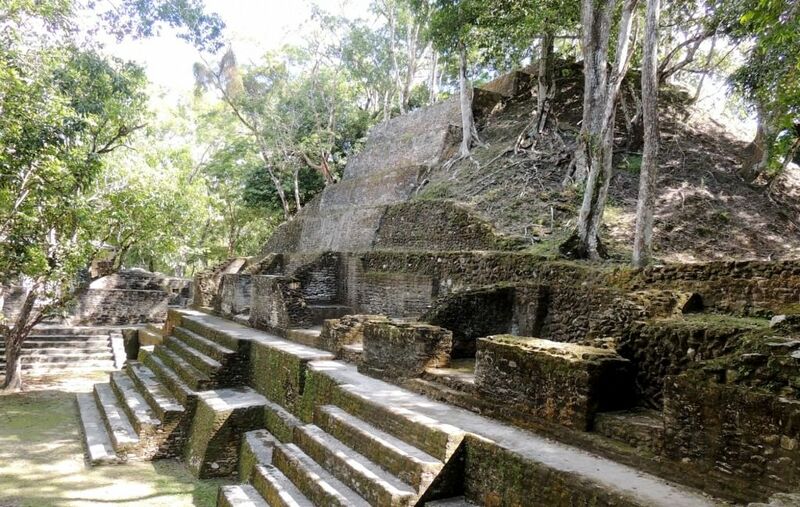 Cahal Pech – This site of Mayan ruins is a 15-minute walk away from the center of the city. It is a tough climb up the hill, but it’s still a lot better than paying an exorbitant amount of money on a taxi. Admission is $5 USD. It allows entry into a small museum with some artifacts and a skeleton on display. The temples aren’t that big, but there are a lot of interior rooms for visitors to explore. Xunantunich’s El Castillo. The view from the top overlooks the Mayan city and the surrounding jungles of Belize and Guatemala. 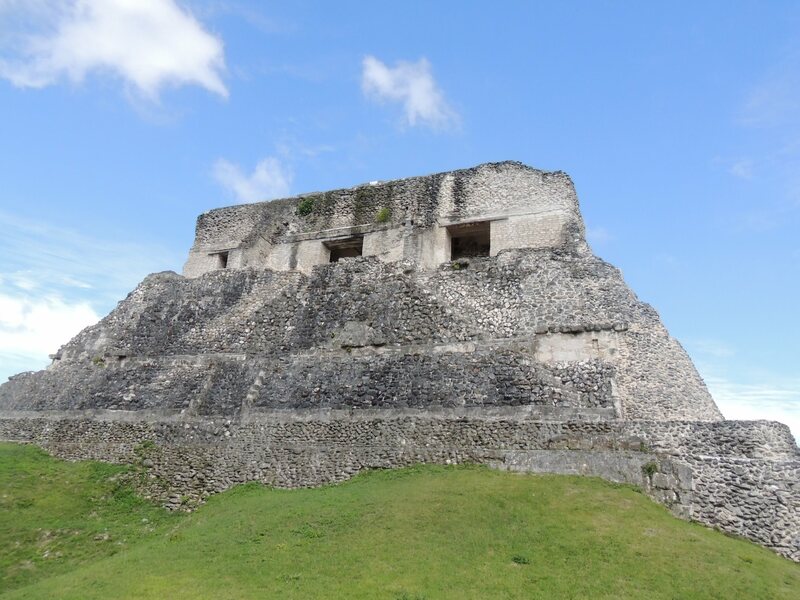 Xunantunich – This is a great half-day trip to another Mayan site. Grab a bus ride to Benque, but tell the driver to let you off at the ferry to Xunantunich (Round trip $1.50). A man uses a hand-crank to pull you across the river. From there, it’s a kilometer hike uphill to Xunantunich. Admission is $5 USD. The museum is smaller than Cahal Pech, but contains a lot bigger artifacts, including the original frieze on the temple El Castillo. Visitors can also climb El Castillo to see stunning views of the Mayan city and even into Guatemala. Market: Every Saturday, vendors head to San Ignacio to create the largest market in the entire country. I saw fish, meat, fruit, clothing, books and music for sale. This is also where I found the best deal on fruit: 10 bananas for $0.50 USD. Visit the Sea Food Shop: Feel like being insulted by one of the funniest men I’ve ever met? Stop by this place. Next to Codd’s Drug Store, the owner David Greig (originally from Scotland) doesn’t even sell fish. When I was there, his inventory consisted of books, movies and Cuban cigars ($10 USD). But I ended up hanging out for hours just talking with this guy who should seriously consider standup comedy. 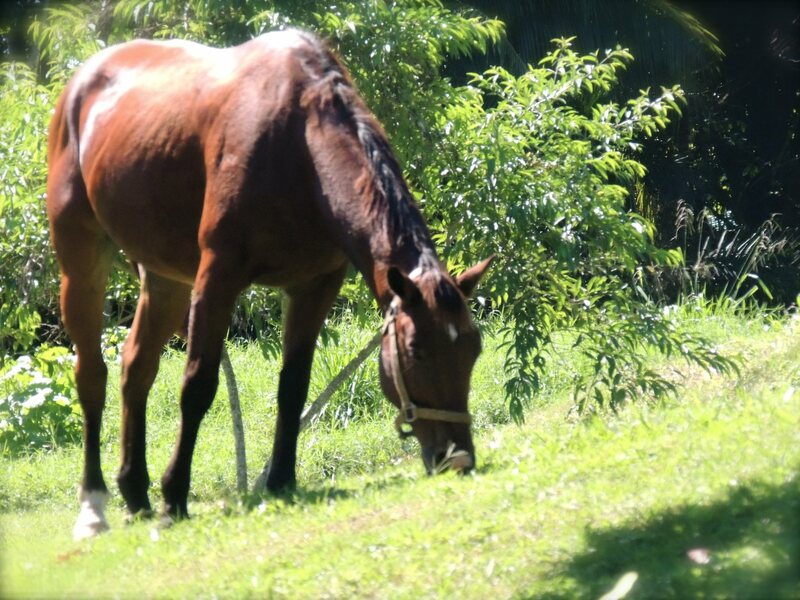 On occasion, I found horses while walking near the Macal River. Walk to Spanish Lookout: This is only for people who enjoy long walks. The journey starts or ends in the most forward-thinking Mennonite community in Belize. I took a taxi there and stopped by for some delicious ice cream. After that, the walk lasted four hours and took me across dirt roads that led to several villages and a hand-cranked ferry. Maxim’s Chinese Restaurant: This is the budget stop for backpackers. You can buy a full plate of fried chicken with rice for $2.50 USD. Don’t expect the food quality to be great, but if you want to fill up for cheap, this is the place to go. 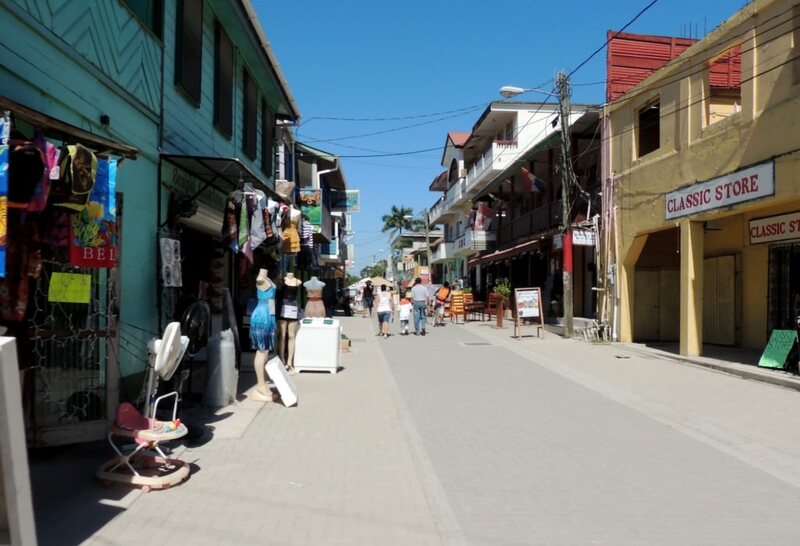 Burns Avenue is the main tourist drag in San Ignacio. This is where Mr. Greedy’s and Flayva’s is located. Mr. Greedy’s Pizzeria and Pub: Good pizza and burgers, but pricey for budget travelers. You’ll spend $7 to $8 USD on a hamburger. A personal pizza costs more than $10 USD. The main reason to come here is for Happy Hour. You can get $1 USD rum and cokes. The bar also has wi-fi and a TV that plays international soccer matches or American football (college and professional). The place is frequented by ex-pats during the day and locals at night. It’s a good place for conversation. Flayva’s Bar & Grill: Great burgers and Belizean cuisine, but a tad expensive for backpackers. Main courses are between $7 to $8 USD. This restaurant also has wi-fi and cheap coffee. Ko-Ox Han nah: Get ready for the most massive quesadillas you’ve ever seen in your life. You’ll be filled after one, and you get four of them. Did I mention how delicious they are? The leftovers are worth the $9 USD. 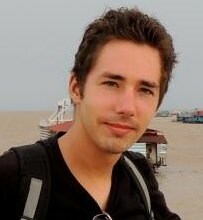 Thai Island: Great bar and restaurant to hang out and meet locals. The food is tasty, authentic and spicy. West of Burns Avenue, is another set of restaurants and bars. Thai Island is located in this set of buildings. Nightlife is hit or miss. Every few days, a Central American tour group passes through and brings tourists to the city. Otherwise, it’s dead. Mayawalk: This is where most tourists will hang out, if any. There is a TV behind the bar that was playing college basketball while I was there. You can also book tours to ATM and other Mayan sites from here, but I can’t personally recommend this organization. Camp 6: Located on the Western Highway, this is a great place to shoot some pool and hang out with the locals. Games are free. It’s less than a five-minute walk from downtown. If you get bored, there’s a karaoke bar next door. Blue Angels: This is the only dance club in San Ignacio. Drinks are overpriced compared to the rest of the city ($2 USD for Belekin). Horribly remixed music is played at decibels that can be heard from several blocks away. Every time I went, it was a dude-fest. Remo’s: This is a day bar three miles away from San Ignacio. 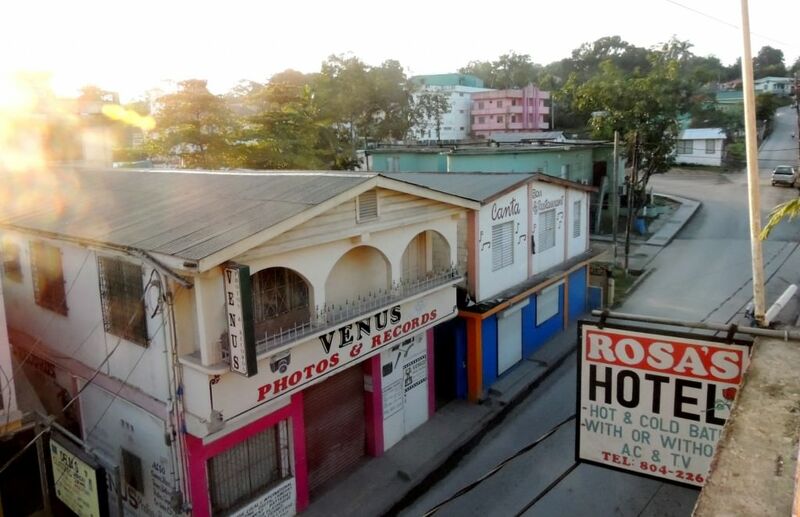 The owner is an ex-pat who’s been in Belize permanently since the 1980s. Picture Jesse Ventura or Stone Cold Steve Austin, and that’s what this guy looks like. He’s got some crazy stories, as do the ex-pats who frequent the bar. If you know someone with a car or motorcycle, it may be worth the drive to check out. You can buy flasks of rum for $5 USD. Sunrise from the third floor of Rosa’s Hotel downtown. One final note: You can find plenty of street vendors downtown and in the surrounding areas. Among the best prices I found were $1 BZE for three tacos; however, be careful. I ended up catching some amoebas because of this. If your digestive track hasn’t adjusted to Central America, I wouldn’t recommend street food. From a budget standpoint, your medicine costs (more than $25 USD) will greatly outweigh any savings you earned on street food. Thanks for your comment Tammy. Mains at Mr. Greedy’s and Flayva’s run between $7 to $8 USD on average. Some items are a bit more expensive, like pizza. Budget travelers can have a night of splurging, but there are cheaper food options in San Ignacio. Rum at Remo’s is the best and cheapest…even when you get a ride on a bike!